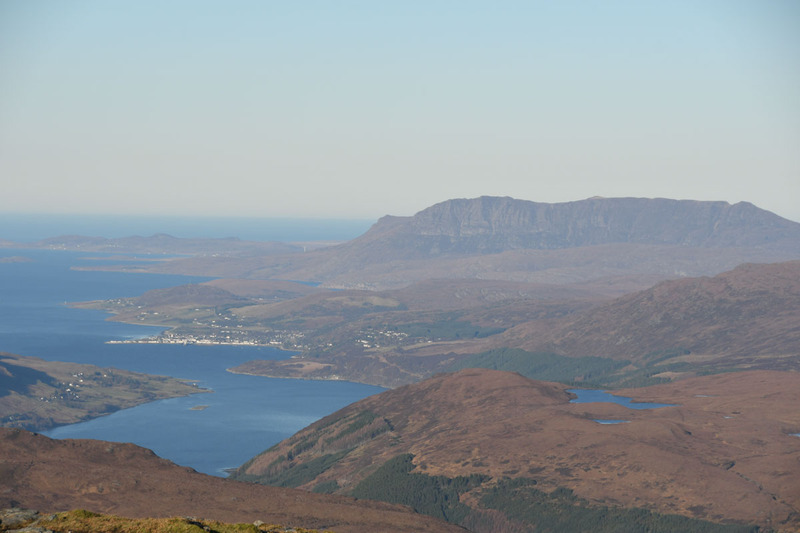 Beinn Enaiglair and Iorguill from Lochdrum. 18th November 2018. Another great looking forecast, and we decided to go and explore an approach we’ve not tried before. 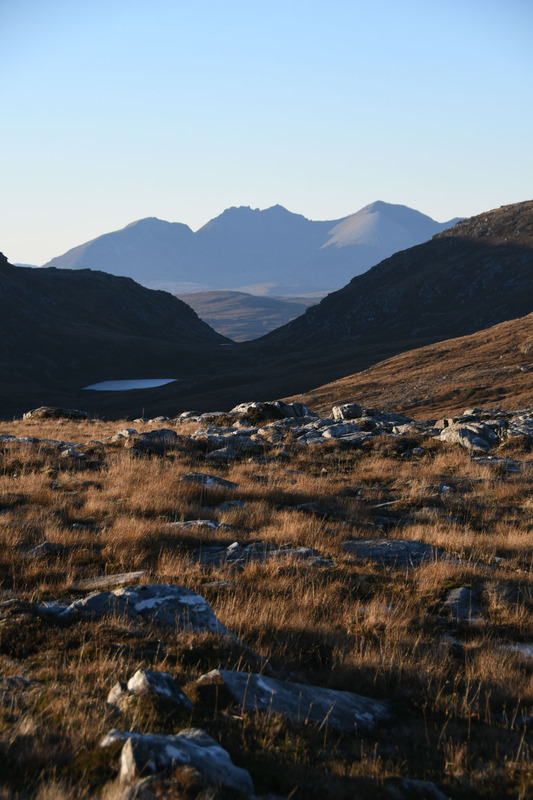 We’ve had half an eye on the approach to Beinn Enaiglair from Lochdrum Farm along a path marked on the OS for a while. 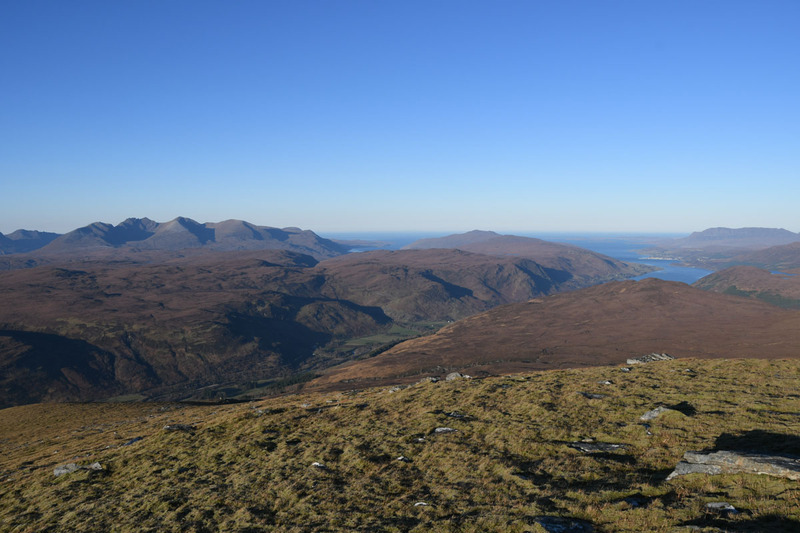 We did Beinn Enaiglair (along with Meall Doire Faid) on a pretty mixed day 10 years ago and it’s been long overdue a revisit. 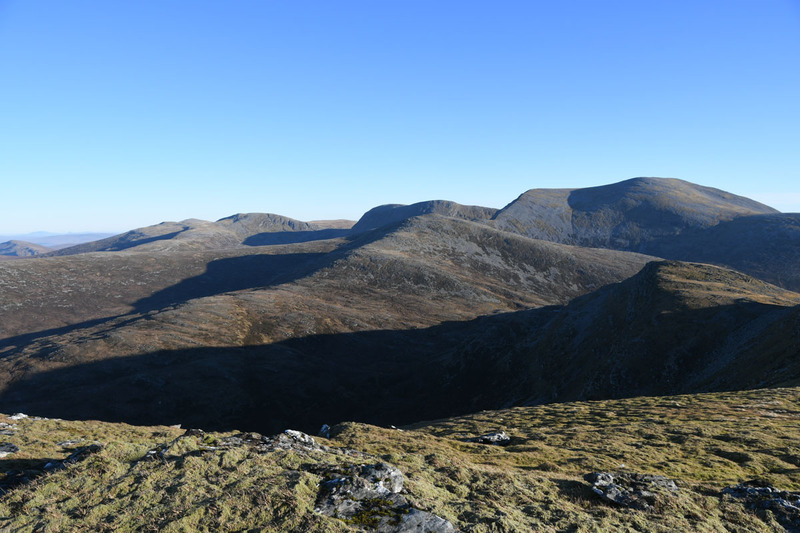 Along side that, the top of Iorguill that we have wandered past on the NW ridge of Beinn Dearg a few times has been irking me with that unvisited feeling for a while. Parked up at Lochdrum at 0700. Predawn light was enough to see by as we set off, unsure as to how to get round the farm buildings to the marked path. In the event we crossed the gate on the east side of the farm, headed 100m uphill and went through a walkers’ gate which is the start of the path. We hadn’t been sure of the path quality, but this is a very well built path, easy to follow and made for quick progress. 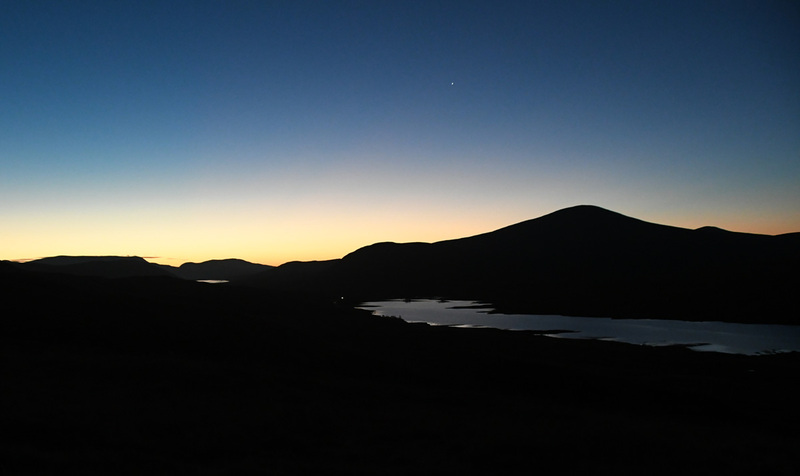 The pre-dawn light was building to the SE. 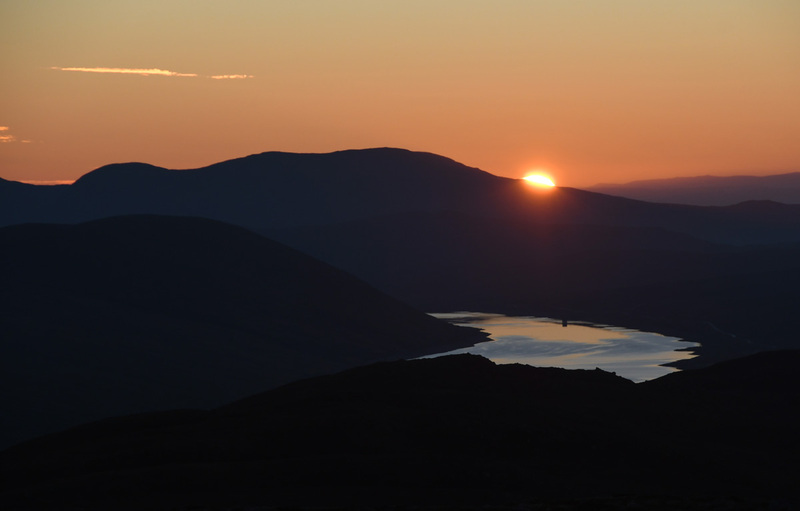 We scooted up the path, and within 40 minutes we were on Meallan Murchaidh at 600m watching the sun roll out from the shoulder of Little Wyvis. Although the forecasts had suggested lighter winds than Saturday we were finding it breezier and quite a bit cooler. 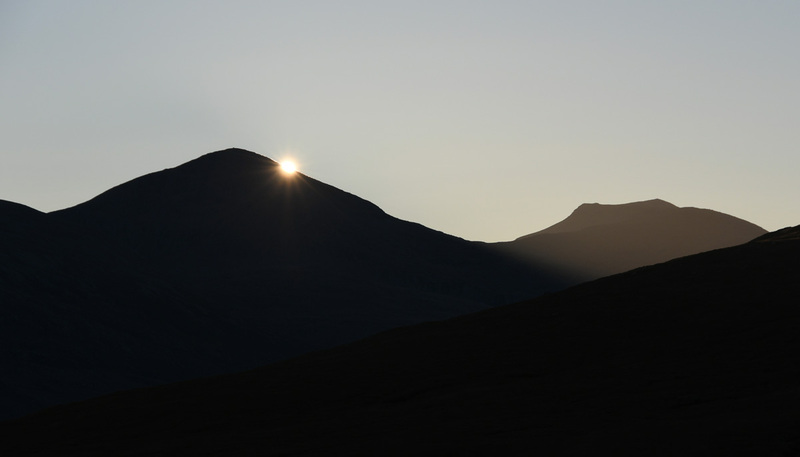 Having supervised sunrise we carried on towards the hills. 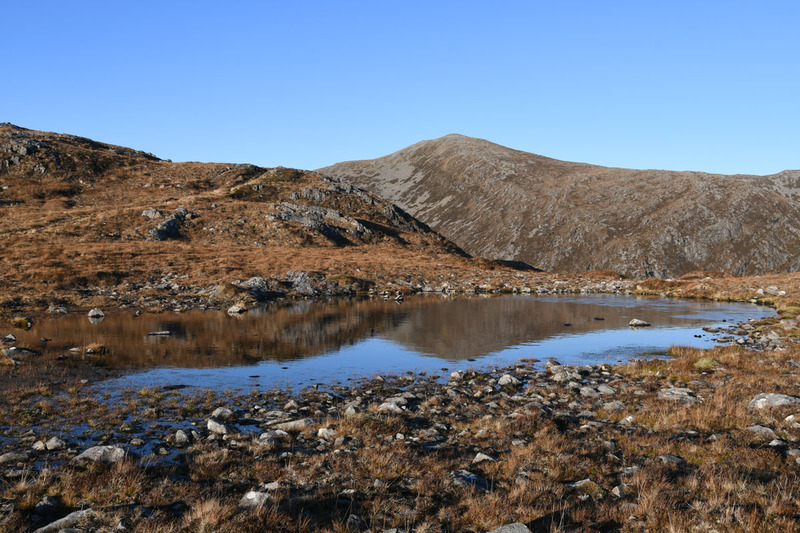 The track continues at or around the 600m mark towards Beinn Enaiglair and Meall Doire Faid. 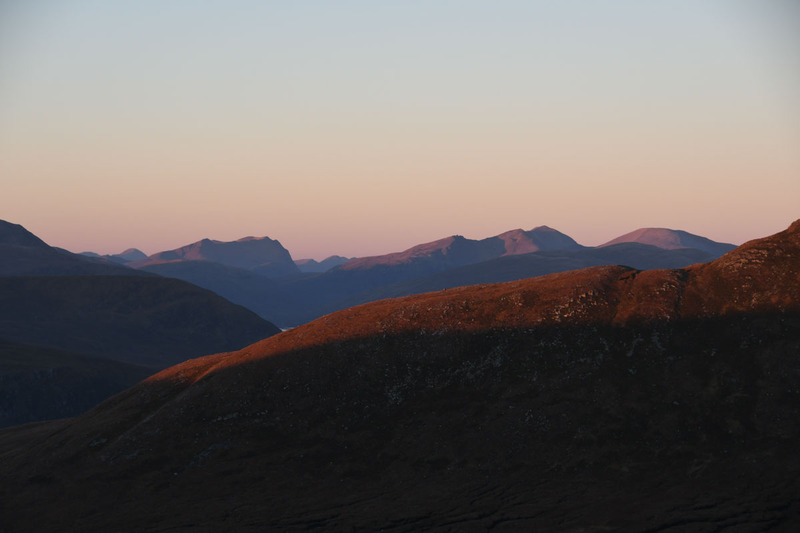 To the NE Beinn Dearg was well lit by the early sun. 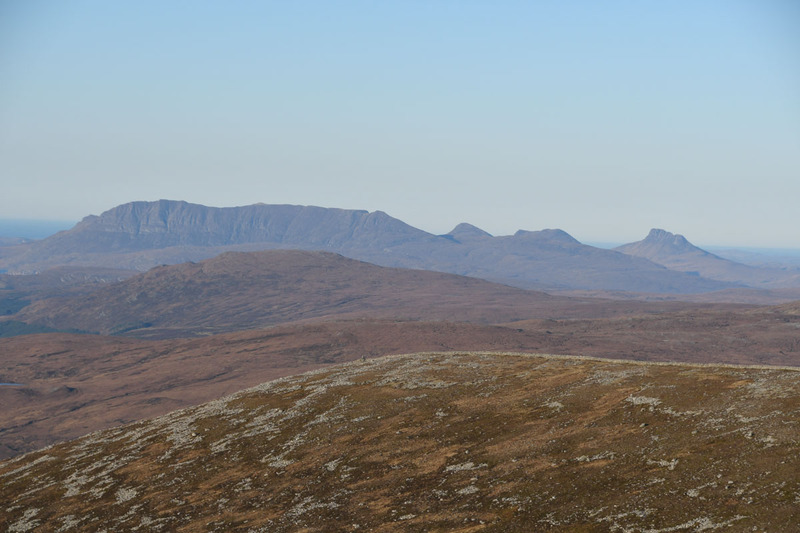 Through gaps to the SW we could see through to Slioch and Mullach Coire Mhic Fhearchair. 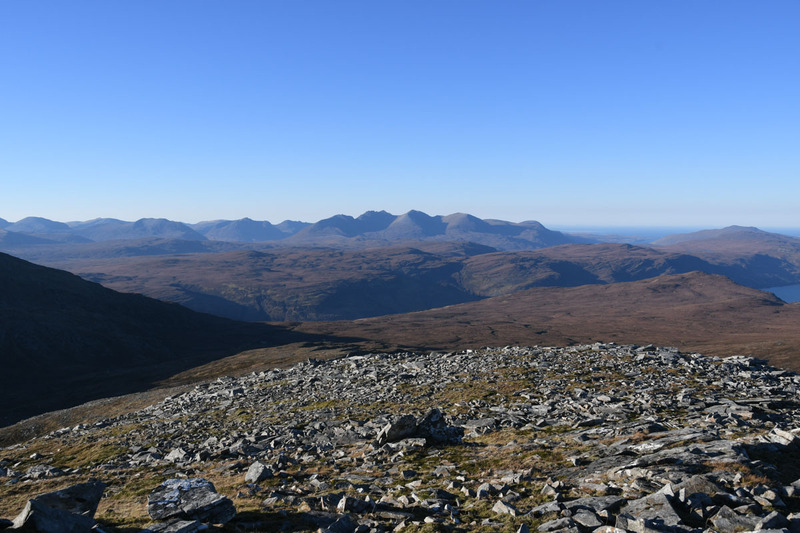 At the 630m point above Loch Feith nan Cleireach we sat and had some breakfast – there was a great view through to An Teallach between Meall Doire Faid and Beinn Enaiglair. 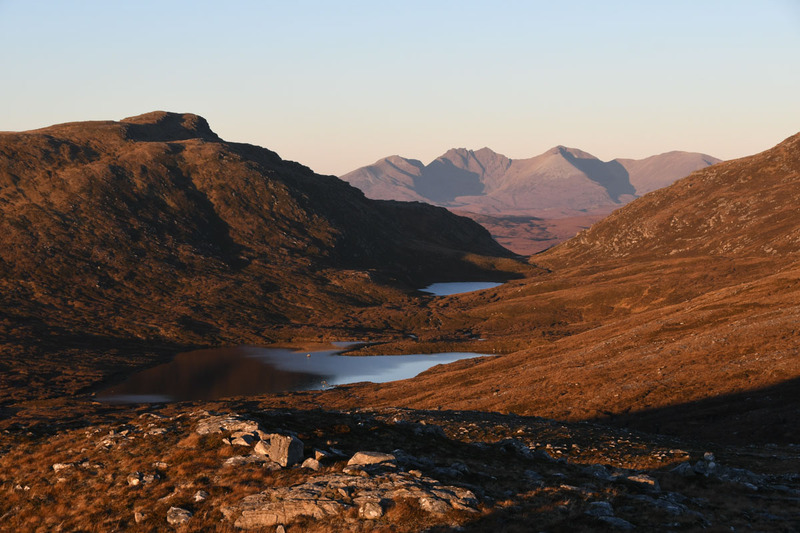 We’d still been pondering the route – either an out and back to Iorguill or a loop over Beinn Dearg. Decided at this point to go for the former. 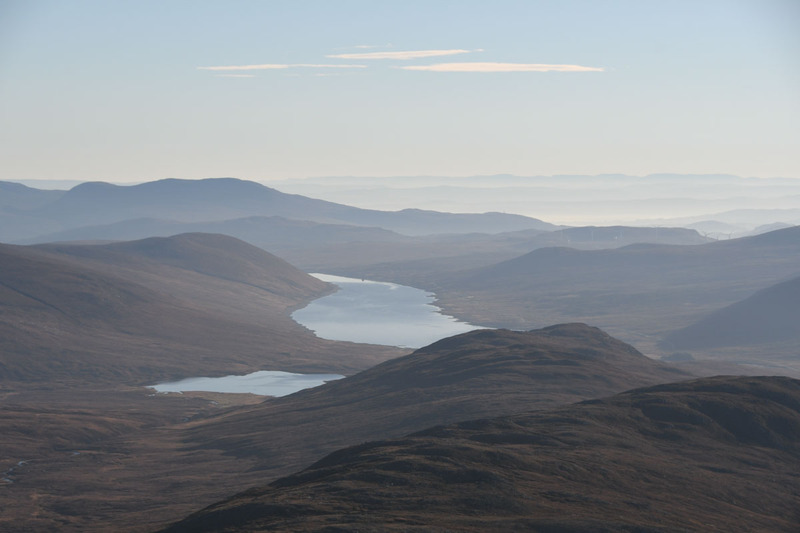 We were, however, very interested to spot a stalkers path on our planned descent route down Allt Beinn Dearg. This area has a lot of unmarked stalkers path, often visible on Google Earth. Relaxed and enjoyed the views in the meantime. From here we carried on along the path to the foot of the SE ridge of Beinn Enaiglair and then carried on up to the summit. 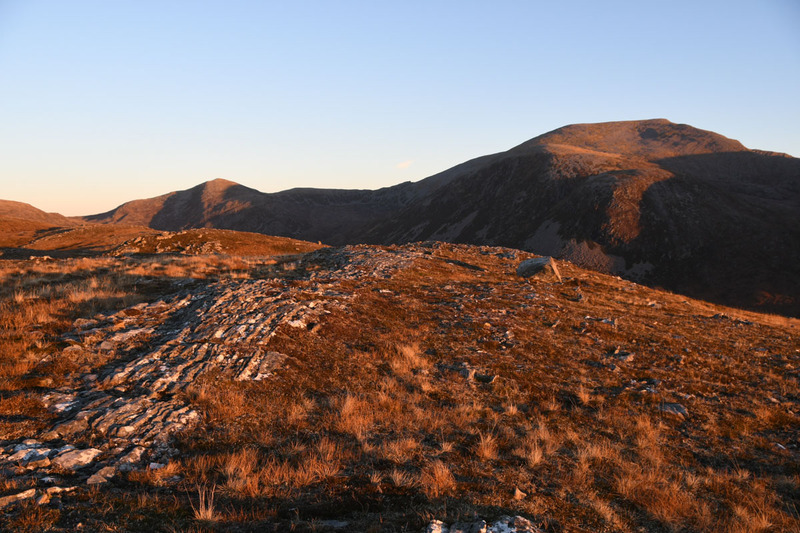 The summit of Beinn Enaiglair is a rather superlative viewpoint with a mossy top – we both instantly thought of camping here. Wandered around at the summit for quite a while enjoying the views. On our last visit I’d had the impression of a rather stony and awkward ascent with little views, certainly altered that impression. 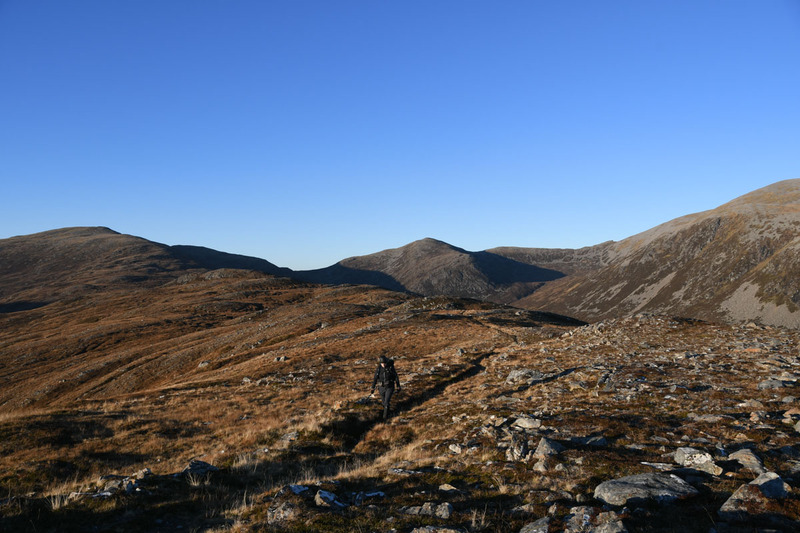 We carried on towards Iorguill. There’s a big zig-zag path which cuts down the NE side of the SE ridge, not on the OS mapping but very visible on satellite imaging. 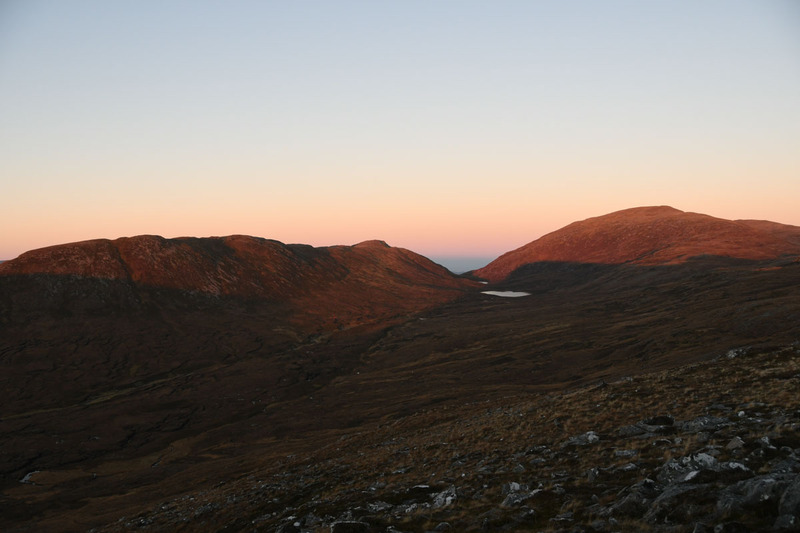 Ambled down this to rejoin the marked path heading towards Iorguill. 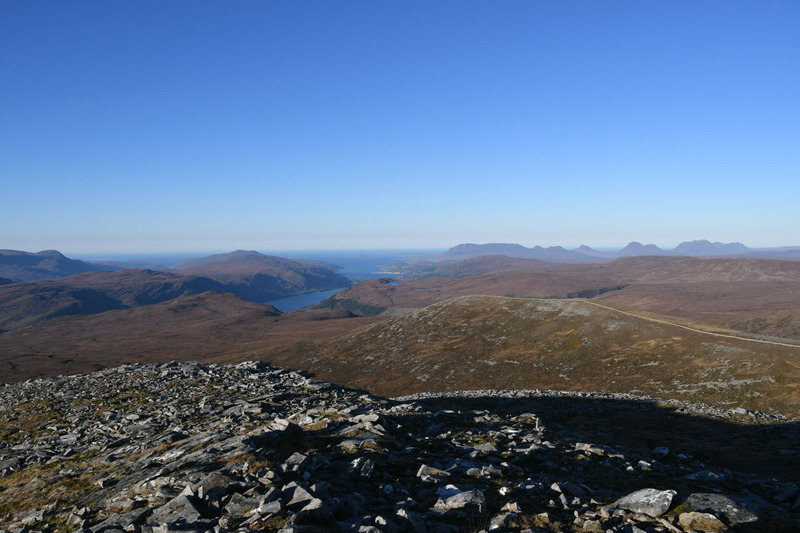 Crossed the low point before picking up another unmarked path up Iorguill. 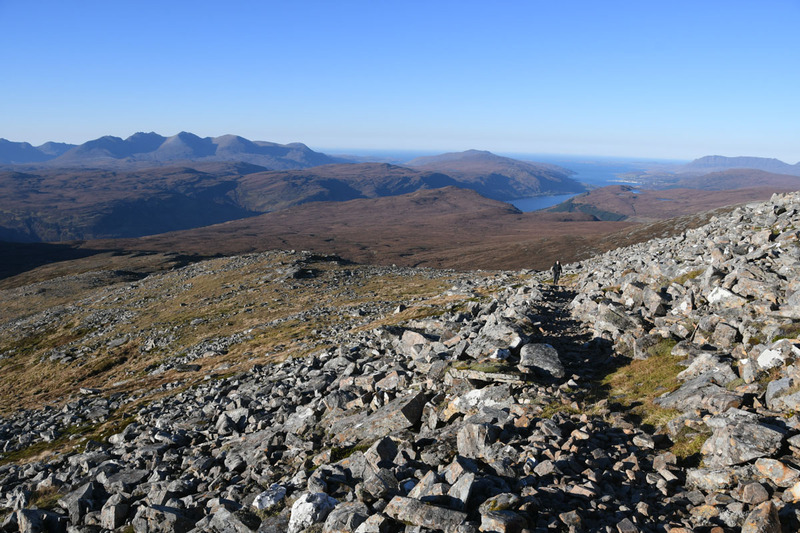 We both wondered if some of these paths were constructed by the labour force that built the Destitution Wall on Beinn Dearg given that they lead up one of the more logical approaches to the NW ridge of the munro. Up to the summit of Iorguill we sat and had lunch out of the wind. Another cracking viewpoint. After a decent sit down in the sun we headed back down the path network with plenty of time to amble. The route was a great one for the time of year, being open to the south meant no prolonged walking in shadow. 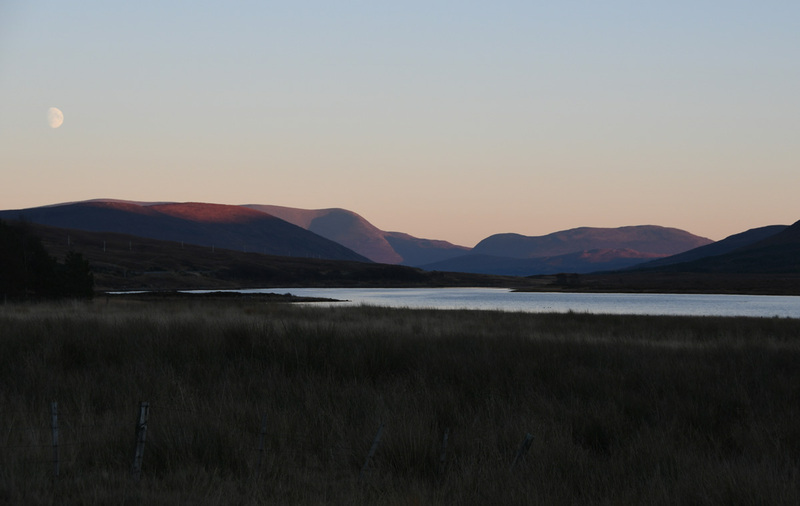 Back to the car about 30 minutes before sunset with a nice view down Loch Droma. 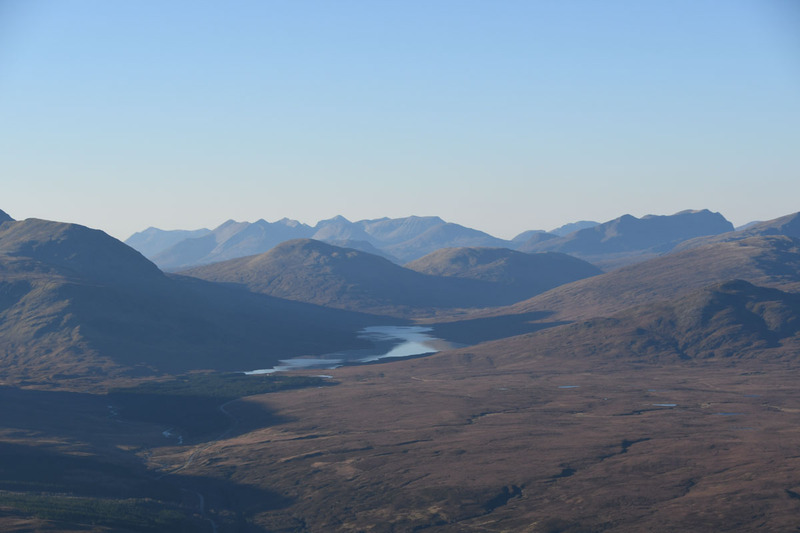 Quite a counterpoint to Beinn Eighe the day before. The Lochdrum approach is very likely to be revisited. 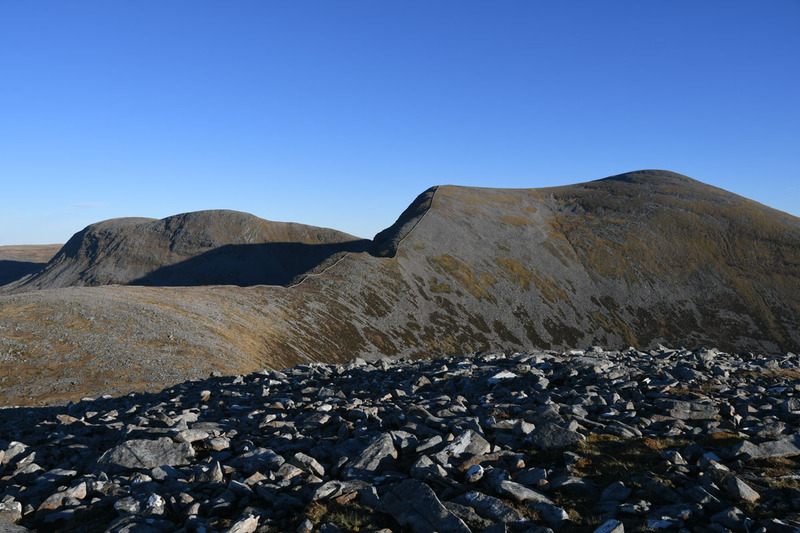 A high camp on Beinn Enaiglair and the loop round Beinn Dearg are both firmly on the to do list. Sections 5, 6, 7 and 9. SE Scotland.